(Newser) – A New York City art dealer who bought the contents of a New Jersey storage locker filled with paintings for $15,000 says he got more than he bargained for, the AP reports. He found half a dozen paintings he believes were done by artist Willem de Kooning, whose works have sold for millions of dollars at auction. The New York Post reports David Killen bought the contents of the Ho-Ho-Kus, New Jersey, locker last year. The paintings were originally from the studio of art conservator Orrin Riley, who died in 1986, and his partner, Susanne Schnitzer, who died in 2009. "What they showed me is a bunch of junk, basically," says Killen. "I didn’t see anything good." Yet he bought the 200 artworks in the hope of later selling them at auction. And when he began loading the works onto his truck, he was caught by surprise: "I see these huge boxes that say de Kooning on them," he says. 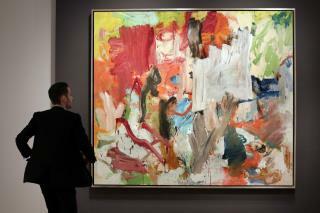 "What are the odds of finding a de Kooning in a storage unit? It’s unheard of!" The paintings aren't signed, but Killen reached out to an expert who's confident they were done by de Kooning, an abstract expressionist from the Netherlands who moved to the United States and died in 1997. "Life is full of extraordinary discoveries," adds Killen. "I've paid my dues. I’m ready for membership in the million dollar club." Never mind that. What I find intriguing is that New Jersey has a burg named Ho-Ho-Kus! That picture looks about like the board that artist mix their colors on. No wonder it was in a storage locker. It's a PIC!!!!…….. It's a PIC!!!!…….. It's a PIC!!!...……….. It's a (wiping away some dust)..……..PICKLEMAN??? ?